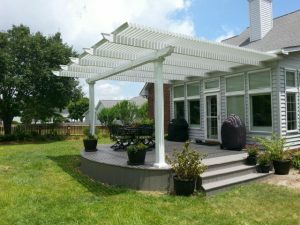 For the finest pergolas in the Hockessin, Delaware, area, turn to the professionals at SRA Home Products. Manufactured by TEMO, a trusted name in the home improvement industry, our pergolas offer the perfect combination of beauty and functionality, and will surely make your backyard or other outdoor living area more enjoyable for years to come. In addition to the high caliber of our products, another benefit of choosing SRA Home Products to install a pergola at your home is our top-notch installation process. Our knowledgeable and experienced technicians only display the highest level of craftsmanship while on the job, and will remain respectful of you and your property every step of the way. For additional peace of mind, however, our pergolas are all backed by TEMO’s limited lifetime transferrable warranty. Contact SRA Home Products today to learn more about the benefits of having one of our pergolas, or any of our other exceptional outdoor living products, installed at your home in Hockessin, DE.